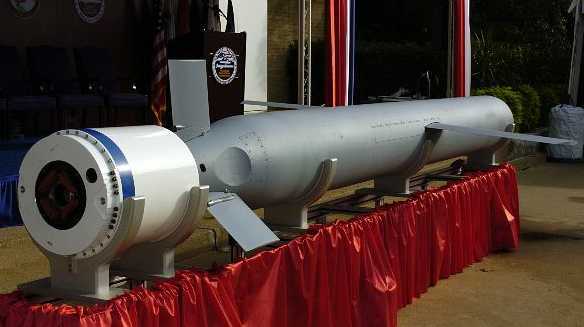 Tomahawk Missile. Photograph courtesy of Naval Technology. 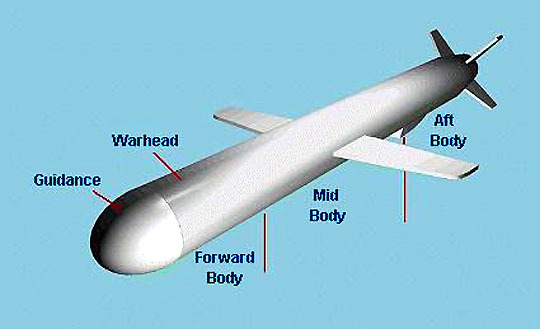 Since the initial development in 1972 there have been four distinct types of Tomahawk cruise missiles. 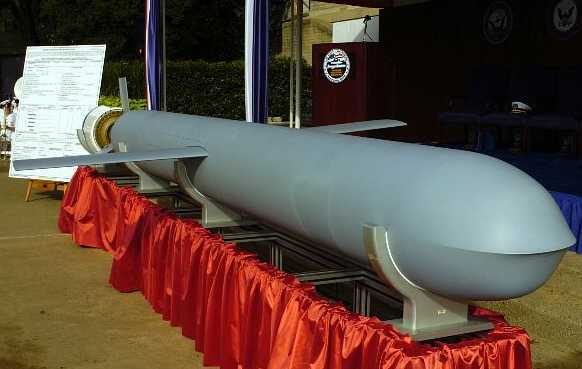 The two nuclear versions, the USAF ground launched version and the Navy BGM-109A, have either been removed from the US inventory or have had the W-80 thermonuclear warhead removed and replaced with a conventional high explosive. Although most publications list the Tomahawk accuracy at 30 feet (9 m), the real truth lies in the computer guidance system. Tomahawk is designed to fly through a one meter square window on earth at a predesignated time. The Tomahawk has about a 85% direct hit record over its use in the Gulf war and further firings since then. Tomahawk uses a combination of GPS (Global Positioning Satellite), TERCOM (a special terrain way-point radar map) and two types of terminal guidance systems to place the warhead with pinpoint accuracy, DSMAC and an Infra-red mapper. DSMAC is a high resolution satellite radar image of the target area which the Tomahawk follows to within feet of the intended target. An additional infra-red scene mapper is also employed for a dual spectrum picture fed to the targeting computer. The two conventional warheads used in the 20 August 1998 attacks on the Sudan and Afghanistan were the conventional 1,000 pound high explosive and the 1,000 pound cluster bomblet warhead which showers a target with a rain of softball sized bombs. The heavy warheads were used mainly against the factory in Sudan and caves or hardened bunkers in Afghanistan. The bomblet versions were deployed directly against "soft" targets such as people, trucks, buildings and light armored vehicles. 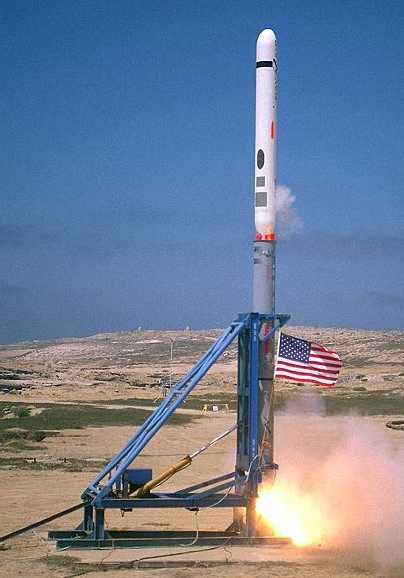 In 1995 the governments of the United States and United Kingdom signed a Foreign Military Sales Agreement for the acquisition of 65 missiles, marking the first sale of Tomahawk to a foreign country. After a November 1998 launch and live warhead test, the UK declared operational capability. The newest Tomahawk, Block IV or Tactical Tomahawk, includes battle damage assessment, in-flight retargeting with a two-way satellite data link, guidance via an on-board Global Positioning System (GPS) and mission planning from the launch platform. The Block IV officially achieved initial operation capability (IOC) on 27 May 2004 with the loading of the first missile aboard the guided missile destroyer USS Stethem (DDG 63). Contractor Test of Tactical Tomahawk at Pt. Mugo, CA in August 2002. US Navy Photograph 020823-N-9999X-001. Tomahawk Block IV being formally welcome into the U.S. Navy at a fleet introduction ceremony held on 29 September 2004 at the Pentagon in Washington, D.C. US Navy Photograph 040929-N-0295M-001. Rear view of Block IV showing launch booster. US Navy Photograph 040929-N-0295M-002.